I'm always looking for skincare products that will help leave my skin with a clear complexion. Since I have sensitive skin, that's sometimes hard to find. So when I heard that Shoppers Life Brand skincare came out with charcoal detox products just in time for summer, I definitely wanted to give it a go since charcoal is a detoxifying ingredient with deep cleansing and absorption that draws oil, dirt and bacteria from the skin helping to unclog pores. I was sent charcoal nose strips, charcoal peel off mask and detoxifying face mask to try. I started off by using the Life Brand charcoal nose strips and the charcoal peel-off mask in succession on the same days. 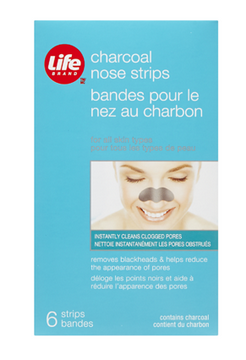 The charcoal nose strips require the same process as the original Life Brand nose strips does, wet the area you wish to apply the strips, apply strip, and wait for it to dry completely to remove. Easy peasy. When I removed the strips after my first use, I did notice blackheads came off along with it, however, I didn’t notice a huge difference in the size of my pores. Overall, the nose strips worked great and I did notice a difference. I then turned to the charcoal peel-off mask. My first go with the charcoal peel-off mask, I followed the directions to the letter. “Apply a thick, opaque, even layer to clean, dry skin.” Don’t do this. You’re supposed to avoid the eye and mouth area, and with the thick layer that they suggested, it will drip before it dries. Since this is a peel-off mask, the drips will be a thick goopy, sticky type of drip. As with the nose strips, I noticed unsavory stuff from my pores come off with the mask, and my skin was as soft as a babies bottom. Woot! However, I didn’t notice a huge difference in the appearance of my skin. I waited two days and then did the process all over again, starting with the nose strips, then the peel-off mask. This time around I didn’t use enough of the mask to be considered “opaque”, I used only enough to grip any stuff from my pores while still able to see a bit of my skin underneath. After peeling the mask off a half hour later, I got that lovely smooth feeling and I definitely saw an improvement in the size of my pores! I was thrilled! Moral of the story, find the process you’re comfortable with, give it time, and you will see results. I definitely like these charcoal products! 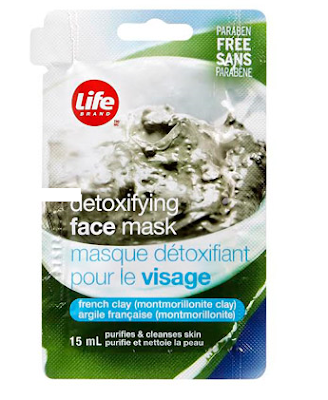 In addition, I also received a one-use Life Brand French clay detoxifying face mask packet. I love these single use packets. I don’t often use a face masks on a regular basis (if I use them too much, my skin produces too much oil), so these little packets are great for keeping my bathroom shelves clutter free and for trying out different types of masks without spending a bunch of money on a full size bottle and finding out it isn’t right for you. The detoxifying mask, made my face feel very clean and tighter. Not like a dry feeling or residue type of tight, but my skin felt more firm. This is the type of mask I would use before an event to help me feel more refreshed. All of the Life Brand Skincare Detox products are exclusively sold at your local Shoppers Drug Mart. 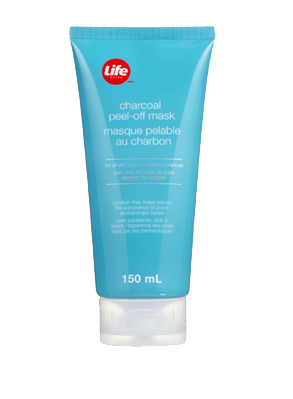 Life Brand Charcoal Peel-Off mask, $6.99, Life Brand Nose Strips, $8.99 and the Life Brand French Clay Detoxifying face mask packets retail between $1.99 or 3 for $5. Disclosure: All opinions are my own. I received Life Brand Skincare Detox products at no cost for the purpose of this review. No other compensation was received.